If you prefer to do your cooking with a gas range rather than an electric unit this fashionable model by Danby Designer could be just what the doctor ordered. This space-saving 24-inch (70 cm) appliance is compatible with liquid propane and natural gas making it perfect for smaller kitchens and remote locations. 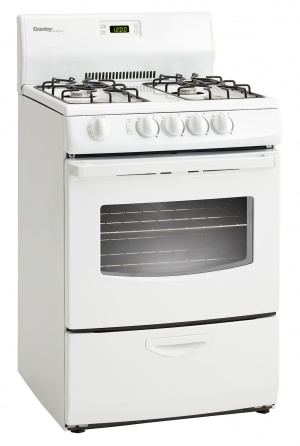 It comes with four 9,100-BTU open burners and a 13,000 BTU oven burner which can be controlled quickly and easily via the smart electronic ignition system with push-and-turn safety knobs. The oven capacity is an impressive 3 cubic feet and it accommodates a sturdy oven rack and broiler drawer. Cleaning the oven is quite an easy task due to the clever white scratch-resistant porcelain surface. The dependable gas range also boasts a large backsplash with high-tech digital clock and timer as well as an integrated lip which is designed to contain spills. This popular model offers 18 months of coverage on parts and labor with convenient in-home service.